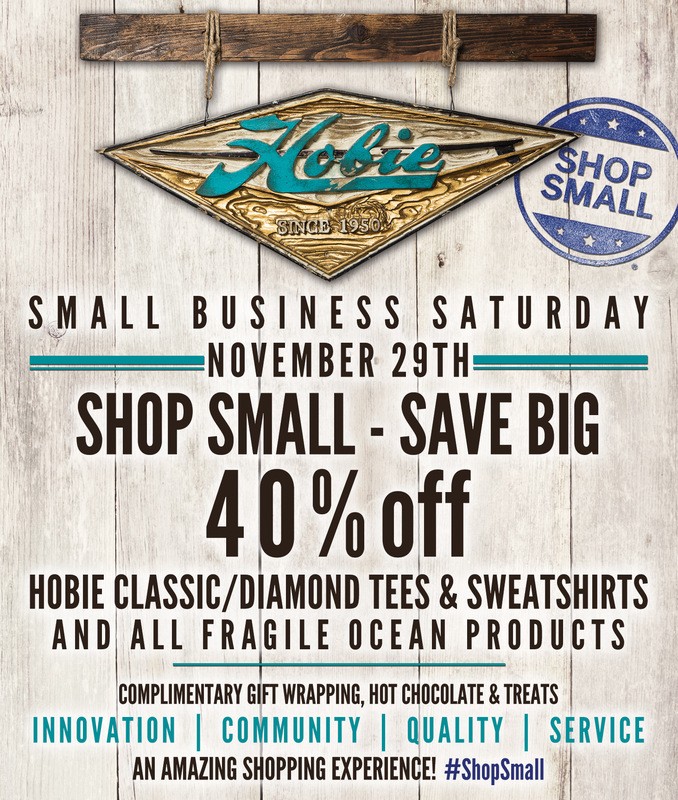 Hobie Shop :: Shop Small Saturday with Us!!!! For 60 years, Hobie Surf Shops have been a small business. Sure, we may have a pretty big global name, but since Hobie Alter shaped his first surfboards in the garage of his parents Laguna Beach home in 1950, our roots have been firmly planted here in Coastal Orange County. We proudly employ 90 local residents split amongst our five surf shops and our warehouse. Our owners, Jake Schwaner and Mark Christy, are longtime local residents too! When you shop small with us, you actively help grow our shared economy! This year, for Shop Small Saturday, we wanted to help you shop even closer to home, by highlighting small local brands that we have available in our shops and online. Some may, like us, have pretty solid name recognition, like Catch Surf and Stance. Some, you may have never known that they are hand made right here locally, like Galileo Jewelry and Arenal Surfboards. Some of our small local businesses are already working together, like SanO Boardriding working with Martin Shapes to create one of a kind surfboards along with their Tees. Some are striving to create better surf specific wear in an incredibly tough marketplace, like 81 Wetsuits and Seea. And, a few small brands, we just flat out love, like Katin, Ezekiel, Salty Crew, ROARK, and Kai. Scan the list below and see all our favorites! Then come in to any of our locations on Shop Small Saturday on November 29th for hot coco, treats, and, as always, gift wrapping! We love seeing you. Remember, when you shop small, you support us all!! This entry was posted in Hobie Heart, Hobie Shop and tagged ....lost, 81 wetsuits, arenal surfboards, brixton, catch surf, corona del mar, Cova, Dana Point, Ezekiel, fragile ocean, Freedom Artists, galileo jewelry, Gnarly, Gooch, Hippy Tree, hobie, Hobie Shop, Hobie SUP, Hobie Surf Shop, Hobie Surfboards, Kai, Katin, Laguna Beach, longboard, martin shapes, PJ Salvage, rainbow sandals, ROARK, Salty Crew, San Clemente, SanO Boardriding, Seea, Shaper, shortboard, Siempre Golden, style, Surf Grass Mats, surf shop, surf shop blog, surf shops, Surfing, surfshops, Teeki, The Surf Brush, Twigs, Victoria Skim Boards, Watermans. Bookmark the permalink. ← Hobie Surf :: Motivation Monday : Our Friends from Hobie Cat Take on The Wave House!